Imagine that you are on a boat cruising through Destin, Florida’s emerald green waters, basking in the sunlight and taking in the sea air. Suddenly, the Captain makes a special announcement and the crew starts clapping and cheering. You peer over the side of the boat and feel an irresistible sense of excitement. Right before your eyes, you see a family of dolphins splashing and playing in the water. This ocean adventure might sound like a dream, but with Southern Star Dolphin Cruises, you can make it a reality! Located right around the corner from our Destin bed and breakfast, this award winning cruise service takes guests on two hour tours around Destin Harbor. Featured on CNN and National Geographic, this family owned business has spotted over 7,000 dolphins. The Southern Star is a double deck, glass bottom boat with a climate controlled cabin. Passengers have plenty of room to walk around on both decks, and can even visit a galley that sells snacks, drinks and souvenirs. 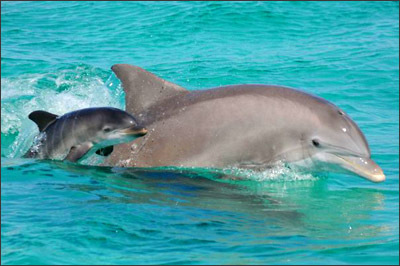 Of course, the highlight of the cruise is the chance to see Atlantic Coastal Bottlenose Dolphins. These dolphins are known for their curiosity towards humans, so the Southern Star’s crew encourages these friendly animals with applause and cheers. The ship’s Captain is very knowledgeable about marine life, and he loves to share information about the habits and behaviors of dolphins. Reservations for the dolphin cruise can be made online on the Southern Star website. After an exciting day out on the water, you will be ready to retire to our Destin bed and breakfast. The Henderson Park Inn is an award winning adults-only hotel featuring a private beach, a seaside cocktail bar and balconies overlooking the Gulf of Mexico. Voted the most romantic hotel in North America, the Henderson Park Inn has everything you need for an unforgettable couples vacation. Visit our Rooms and Rates page to find the perfect suite for your next trip to Destin!